Ahead of Apple's now-confirmed September 12 media event, during which it's believed to announce the newest versions of the Apple Watch, iPhone, and Apple TV, Men's Health was invited to visit Apple's secret exercise lab where activity data on its wearable device is collected. Apple invited the media to its Apple Watch lab before the launch of the original Apple Watch in early 2015, and now Jay Blahnik, Apple’s director of fitness and health technologies, said that the lab has "collected more data on activity and exercise than any other human performance study in history." Although Apple revealed the lab in 2015, Blahnik mentioned that work in the department has been ongoing for the past five years. 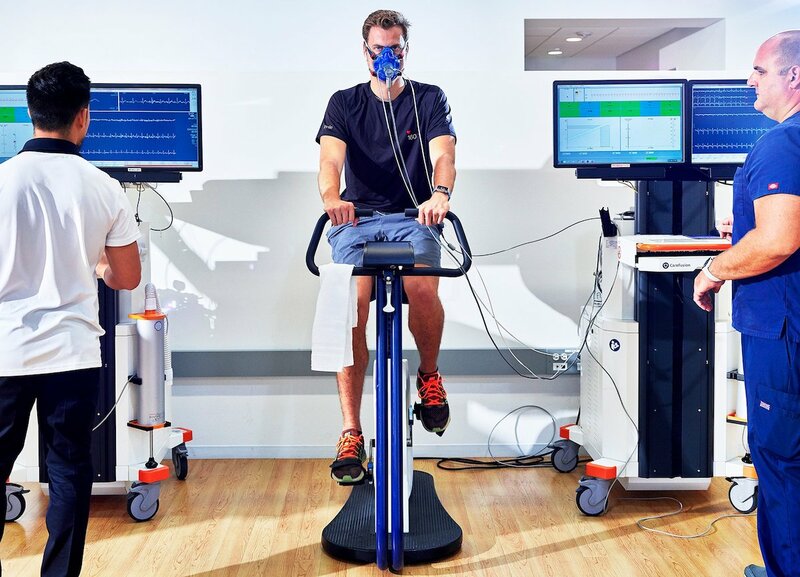 The lab enlists Apple employees to perform various exercises while hooked up to metabolic carts, ECG machines, and $40,000 masks that analyze calories burned, oxygen consumption, and more. Around 40 employees work out in the lab at one time, all monitored by 13 exercise physiologists and 29 nurses and medics. The lab includes a studio for group fitness programs, one room with an endless pool to measure the new waterproof abilities of Apple Watch, and another trio of rooms mimicking intense temperature conditions, which Apple calls "Higher, Faster, and Stronger." In 2015, Blahnik said the lab had collected over 18,000 hours of fitness data on over 10,000 workout sessions, and now those numbers have jumped to 66,000 hours and 33,000 sessions. “Our lab has collected more data on activity and exercise than any other human performance study in history,” says Jay Blahnik, Apple’s director of fitness for health technologies, in a rare interview. “Over the past five years, we’ve logged 33,000 sessions with over 66,000 hours of data, involving more than 10,000 unique participants.” A typical clinical trial enrolls fewer than a hundred participants. Blahnik commented on the "game-ifying" of fitness challenges that Apple has introduced with Apple Watch and Activity Sharing, where users can follow their friends' calorie, workout, and standing data throughout the day, and encourage or taunt one another in the process. He said that Apple's goal was to make it easier for people to feel part of a workout community, even when they aren't nearby one another, providing another "fun way to stay in touch" with friends on Apple Watch. With watchOS 4, Apple Watch devices will also be gaining the ability to provide more nuanced insight into each user's daily goals, and give them little prompts towards the end of the day regarding how close they might be to closing an Activity Ring. The company has put together corporate fitness challenges around all of these activity features in the past, which Blahnik said has catalyzed healthy lifestyles that many employees continue to maintain. The third-generation Apple Watch -- expected to be called "Series 3" -- is rumored to include cellular connectivity, further untethering Apple Watch from iPhone and allowing users to send messages and stream Apple Music solely on the wearable device. The Apple Watch Series 3 was originally rumored to see a major design overhaul, but more recent reports have said that added LTE connectivity will be the third generation's big selling point and a form factor change will be held for a future device. It's crazy that they spend so much time on this, yet they're own app is leaps and bounds behind the likes of Garmin and Strava. Also, the inability to view the info on a PC or iPad is insane. I think it was the correct decision that Apple made five years ago to build their own lab and develop their own models for fitness tracking. These models really empowered Apple Watch fitness tracking, which maybe is one of the biggest selling point of AW compared to other smart watches. Agreed. Quite impressive to see what they've done here. I love reading about this stuff. 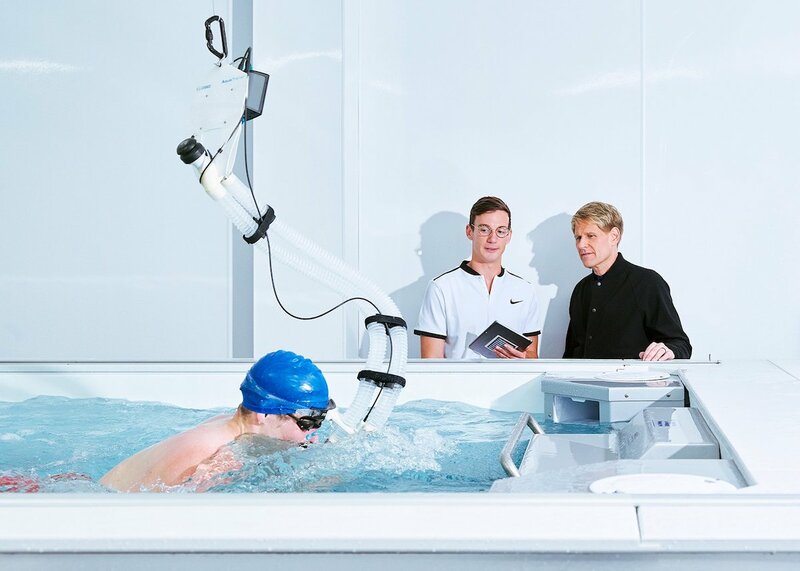 Was really fascinated last year to see how much work they had put into swim testing the Series 2. I give Apple high praise. The AW for sure helped me improve my fitness. I am an avid swimmer and after using the AW my performance has improved quite a lot. The data and challenges definitely helps push me further. The Apple Watch is a motivator and tracker based on the users results. Apple can't guarantee any weight loss or results based on the Apple Watch alone, it's all about the individual that puts the effort in to lose the weight and stay motivated. The Apple Watch is a tool that serves as a reminder and a fairly accurate tracker to help monitor where the user is at in terms of calories and or cardio. The individual has to set goals and standards for themselves, which the Apple Watch can help regulate statistical data for measurement. Clearly aint working for the guy on the right. So what makes apple think it'll work for the average joe when the technician with all the tech at his disposal is over weight. Not the average - but - Joe Kovocs. Clearly an Athlete. Still fat. Don't see your point. By the looks of him I’ll bet he could bench press you and then some. This is why’s the Apple Watch is so expensive, not because of crazy hardware or mind blowing software, but because of apple’s investment in developing and researching fitness tracking algorithms. As of right now I can’t say that the proportional cost of investment vs. the actual quality and options in the fitness app is really quite worth it, but hopefully it will all pay off with the introduction of dozens of new workout choices with the Apple Watch Series 3! Let’s hope those rumors are true, because if so there will be no single divice on the market quite so accurate and versatile for fitness tracking. I'm not sure what this response has anything to do with your first post that I quoted you on, as you stated "So what makes apple think it'll work for the average joe." Regardless, Apple doesn't have to find any 'magic formula'. As I already stated, The Apple Watch is a tool/motivator for the individual to better themselves. Apples job is to put out the best possible product that helps the individual to understand their calorie/cardio ratio. The individual does everything else that they need to based on their effort with physical exercise. That's my point. I still can't help but feel Apple Watch fitness is "fitness lite." Bottom line is competitors from Fitbit and Garmin both now have MORE accurate optical HR sensors, record FAR more fitness data (every single second 24/7 vs. about once per TEN MINUTES on the Apple Watch except during workouts) and because of their superior battery life have built in automatic sleep tracking that truly works (while Apple doesn't because most need to charge their watches at night). On top of this Apple's attempts at tracking runs and other fitness events is weak vs. competitors. Apple has no good way to track intervals, plan workouts, see data points while on a run, and see extensive data summaries after a run and over time. Garmin in particular kills Apple here and even Fitbit shows far more. Both competitors even auto-sense activities like running, walking, biking etc. and will auto-record and summarize workouts even if you don't start manually tracking them! I'd thought that 3rd party apps would cover the slack for Apple but limitations in the APIs still result in the Apple Watch being a far less serious fitness watch vs. almost any competitor. I'm *glad* Apple is adding fitness capabilities to the watch, but I'd love to see far, far more... the potential is there but both the hardware and the software need to catchup to their fitness focused competitors.